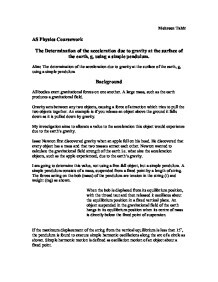 The determination of the acceleration due to gravity at the surface of the earth, g, using a simple pendulum. All bodies exert gravitational forces on one another. A large mass, such as the earth produces a gravitational field. Gravity acts between any two objects, causing a force of attraction which tries to pull the two objects together. An example is if you release an object above the ground it falls down as it is pulled down by gravity. My investigation aims to allocate a value to the acceleration this object would experience due to the earth’s gravity. Isaac Newton first discovered gravity when an apple fell on his head. He discovered that every object has a mass and that two masses attract each other. Newton wanted to calculate the gravitational field strength of the earth i.e. what size the acceleration objects, such as the apple experienced, due to the earth’s gravity. I am going to determine this value, not using a free-fall object, but a simple pendulum. A simple pendulum consists of a mass, suspended from a fixed point by a length of string. The forces acting on the bob (mass) of the pendulum are tension in the string (t) and weight (mg) as shown. When the bob is displaced from its equilibrium position, with the thread taut and then released it oscillates about the equilibrium position in a fixed vertical plane. An object suspended in the gravitational field of the earth hangs in its equilibrium position when its centre of mass is directly below the fixed point of suspension. th oscillation the stop watch would be stopped. I also decided that it would be necessary to become accustomed to the rhythm of the oscillations before starting to count them. This would be done by counting down to 0, counting 3, 2,1, 0… as the pendulum completed these oscillations and as the bob hit the left extreme on the 0 count, start the stop watch. This would reduce the risk of human error in counting. There was one particular problem that I came across when trying out my intended method in my preliminary experiment. This would cause an error in the results. It seemed as if the pendulum wasn’t swinging in just one plane, but in circles. This would cause a problem, as the pendulum would not be undergoing the planned oscillation. I found that to correct this problem, minor adjustments needed to be made to the apparatus set-up. It is necessary to make sure that the wooden blocks have well-defined right angles and are clamped in well. The string of the pendulum should hang at 90˚ when in equilibrium position. This measurement needs to be checked before any readings or results are taken. If not hanging at 90˚, the wooden blocks need to be adjusted, either in the clamp or in relation to one another, so to achieve this. I also realised that it was necessary to make sure that the string is clamped vertically between wooden blocks. I decided that it would be easier to ensure this by making markings on the wooden blocks and then I could check that the string passes through these. If any problems appeared to occur, such as the one above or if I lost count of the number of oscillations I would discard that result. -² + 0.10 which is 9.97ms-² and the lower limit is 9.87ms-² - 0.01 which is 9.86ms-². There is only 0.11ms-² between the upper limit and lower limit: 0.11/9.87 x 100 = 1.11%. This percentage difference is so small, that I think the conclusion is reliable being based on these results. One way to better the experiment that I carried out to determine the acceleration at the earth’s surface due to gravity would be to somehow devise a mechanical method of counting the oscillations and also a mechanical way of starting and stopping the stop watch, so to eliminate reaction time of the experimenter having effect on the results. Perhaps a laser beam could be used as a sensor to count the oscillations. If connected to a logger, the number of times the laser beam is interrupted, by oscillating pendulum count be used to determine how many oscillations have been made. The calculated period would be more accurate and precise if error such as the above could be eliminated and the experiment bettered and the margin of uncertainty made much smaller. The value I have found is a value for the acceleration due to gravity at the earth’s surface only. The earth’s gravitational field varies all over the earth. It would be interesting to see how much it varies and by how much. For example, it is said that at the equator the acceleration due to gravity is different to at the poles. The two times were averaged and the result was divided by 20 so as to find the time for one oscillation which was then squared. The length of the pendulum was decreased by 0.1 m each time. The pendulum should swing freely without hitting anything. This involved checking things like the connection between the bob and the string as well as the retort stand. The stand itself was clamped to the desk to ensure it didn't fall over. The bob itself wouldn't be dangerous as long as the method was followed properly by giving it a displacement of 10 degrees. This says that the force is proportional to the sin? ?and not just ?. So it is not a simple harmonic oscillator. However, if we confine ourselves to small angles, mathematically we will find that the sin? ~ ?. Small angles of less than 20 degrees are usually acceptable. Consequently, time of oscillation is certainly affected by the length of the pendulum. Energy is converted into heat in order to overcome air resistance. Eventually, the pendulum will come to a halt. In theory, a constant swinging motion could only be achieved inside a vacuum, and one major source of gravity. Time period 1 . (for a fixed length). gravity But since I perform my experiment in one position I can consider the acceleration due to gravity as constant. To prove that T� is proportional to L, I compare the period equation of a simple pendulum with a straight line graph equation. Measuring Acceleration due to Gravity using a simple Pendulum. * Digital stopwatch * Linear graph paper They were set up in the following way: The pendulum should have swung no further than 10? from the vertical. The experiment was repeated three times to retrieve a more accurate result and twelve readings were recorded over 1.2m. To determine the relationship between mass and acceleration when force is kept constant. acts in the opposite direction to the way the object is moving. Between two surfaces it depends on: a. the type of surface b. the size of the reaction force. Air resistance is a special type of frictional force, which acts upon objects as they travel through the air.